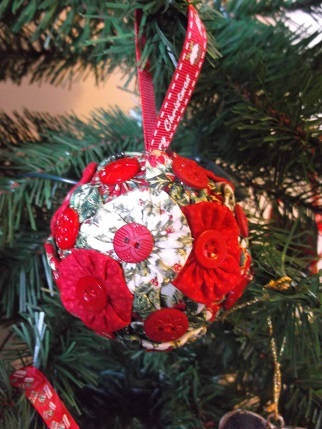 In between marking and knitting Sarah’s sample I have been having a little browse around the internet for Christmas ornaments for the coming Crafternoon. I do love the internet for getting ideas, what would we do if it broke? I would be so sad without reading all the lovely blogs and watching You Tube tutorials. 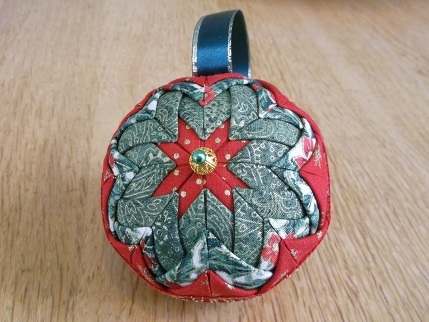 Anyway I found some pictures of a gorgeous ‘quilted’ bauble which looked very complicated but isn’t – and thanks to this Quilted Xmas ornament tutorial managed to make one, isn’t it pretty! I think they might be my favourite ornaments so far, it is a hugely therapeutic make and takes very little concentration so will be doing many more of these. 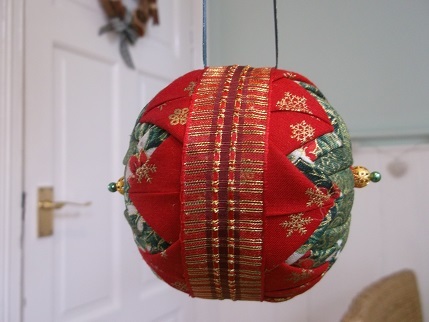 I know I said that the Suffolk Puff bauble below that I made one of late last year would be my gift ornament of choice this year but these are so stunning I will have to make more. Plus they use up lots of fabric so I will be able to clear some of the stash! All good. 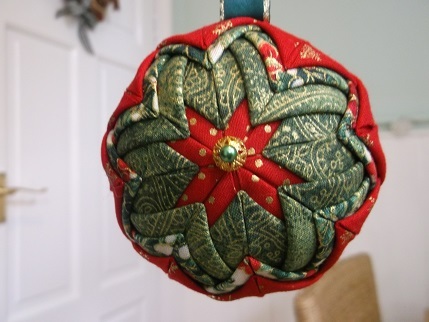 I found this Quilted Xmas ornies Pinterest board with lots and lots of other examples of them on so will use this for inspiration. 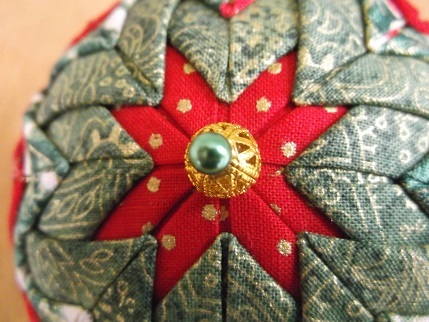 If you prefer written instructions this is a Quilted Xmas ornies written tutorial and they use a feature fabric for the centre fussy cut rather than the folded pieces. These would make a lovely gifts for younger relatives and I have seem some examples with names embroidered on the centre piece or cross stitch motifs. Now off to Ebay just to stock up on a few more Christmas charms, miracles of internet shopping! I have a mate who ‘s a computer programmer/coder. His whole job is patching up bits of the Internet when it breaks! That looks quite complicated – but fabulous!